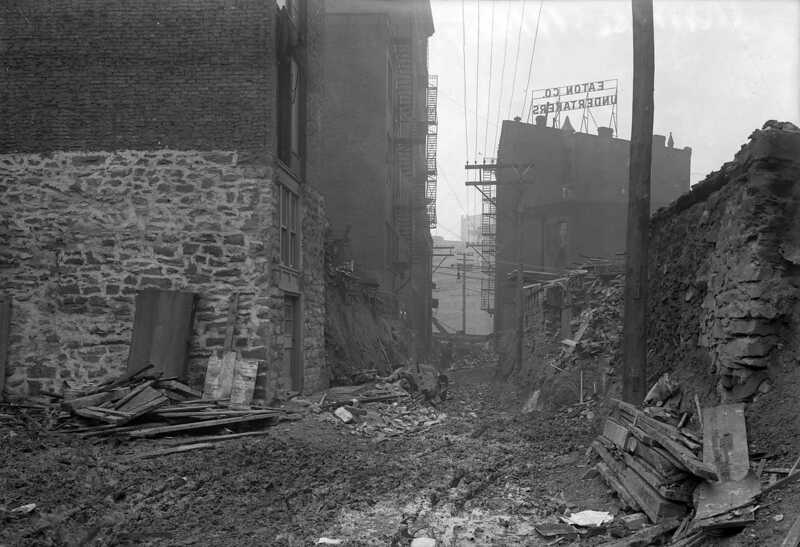 View of hump cut progress along Dante Alley looking west from Pentland Street towards Sixth Avenue, showing the back of the Eaton Co. Undertakers building. The "hump" cut took place in the downtown area known as Grant's Hill. The project began with planning in 1909 and ended with the final cut in 1913. It changed the gradient of Grant Street, Diamond Street, and Oliver, Fifth, Sixth, Webster and Wylie Avenues. Please see Frederick Law Olmstead, Pittsburgh Main Thoroughfares and the Down Town District: http://digital.library.pitt.edu/cgi-bin/t/text/text-idx?c=pitttext&view=toc&idno=00aep1324m for more information. Streets--Pennsylvania--Pittsburgh--Maintenance and repair. ; Commercial buildings--Pennsylvania--Pittsburgh. ; Street lighting--Pennsylvania--Pittsburgh. ; Dante Alley (Pittsburgh, Pa.). ; Downtown (Pittsburgh, Pa.).